Okay, on to today's review, cookie butter! So at that point I figured that jar was a lost cause, and I just let my sister and I have at it! I then went back to Trader Joe's to buy a replacement, and here we are! I obviously loved the product itself, since I did demolish an entire jar of it, but what I don't love about this product is it's labeling. What is up with this typeface for "Cookies & Creme?" It's hideous and honestly, it's hard to look at. I feel like my eyes are unfocused, or that something printed incorrectly, but I'm pretty sure this weird scratchy black outline on that yellow font was intentional. That font in particular is the biggest offender, but the rest of these typefaces seem really clunky and out of place too! What is happening? The last few Trader Joe's products I reviewed had really nice packaging and designs, but this? It's a mess! Even the color scheme seems really odd. We have white, yellow and blue, which are a decent color combination, but then you through in this blush pink color? Why? 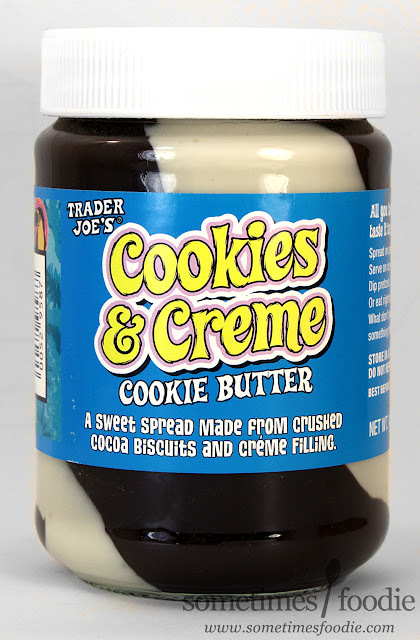 It's such an unattractive combination of colors and design choices, they're lucky this product is delicious and that Trader Joe's has a strong reputation when it comes to their cookie butters, because this jar is perhaps one of the ugliest Trader Joe's products I've ever purchased, and if I was judging this based on looks, I never would have bought it. Thankfully I didn't judge this book by it's UGLY cover, and I bought it anyway, because it tastes AMAZING. 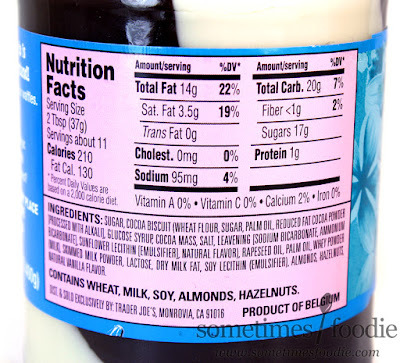 The chocolate swirled portions taste like crushed up, spreadable, Oreo cookies with little crumbly textured bits that remind of of crunchy Biscoff spread. Of the two flavors, the chocolate portion is my favorite and I found myself carving away it it more than the white "creme" layer, but I've always preferred the chocolate cookie to the white creme when it comes to sandwich-style cookies. 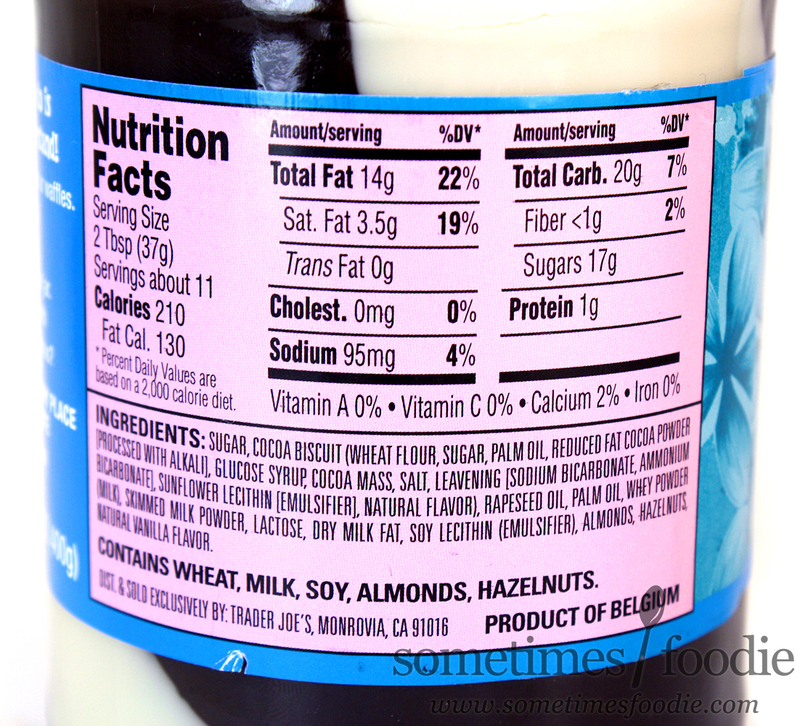 The white "creme" portion of this spread isn't half bad either, it's just not my favorite of the two. 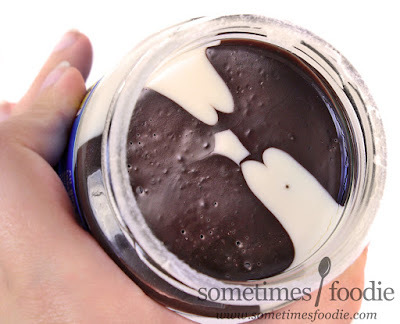 This filling-like portion of the jar isn't as waxy and shortening-based as the creme you'd find in a real Oreo or off-branded chocolate sandwich cookie, and when you combine the two, it's all the flavor of a sandwich cookie, but in a spreadable paste that will make you hate yourself in the morning. Now, why would you want your Oreo-style cookies in a spread form? Is there an added benefit or purpose? My sister and I just sat there and ate this stuff out of the jar with a spoon, like heathens, which was awesome, but I tried to come up with a few purposes for this stuff. Use is as a swirl or marble in brownies, cheesecakes, and other baked goods to amp up the cookie aspect and make something feel fancy. The spreadable jar aspect makes eating in bed and regretting your life choices a lot less crumby. There may not be a concrete reason why you should buy this cookie butter over real cookies, but there's no reason not to either. I love this stuff, and this second jar is already about to bite the dust, so if a food blogger with access to tons of junk food STILL ate two jars worth of this stuff, you know it's gotta be good. 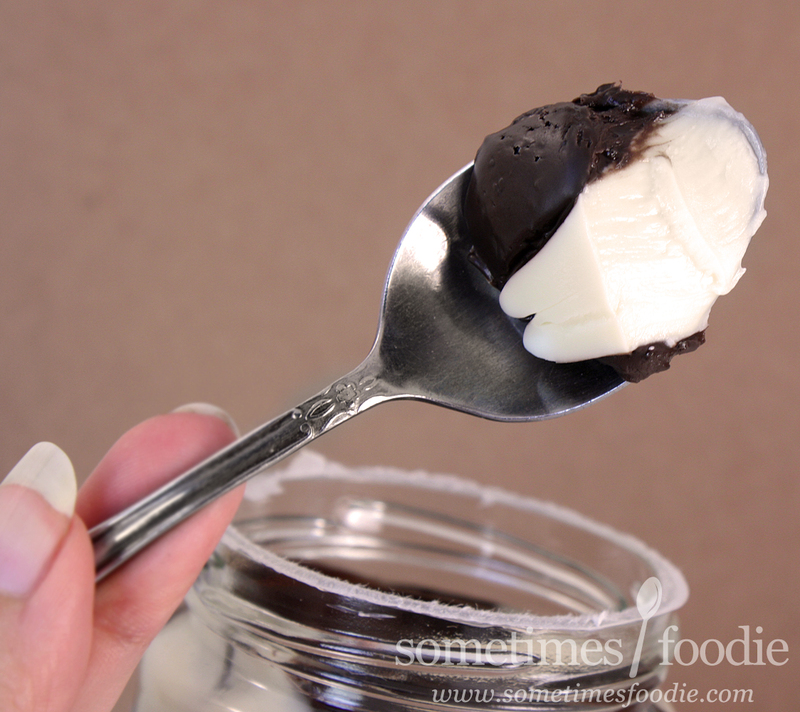 If you like chocolate sandwich cookies, you owe it to yourself to check this out. I bet it would be amazing spread on waffles, too. Pancakes? Anything hot, to make it more gooey.